It’s the last day of Nanowrimo planning. I awoke feeling pretty horrendous. I can never anticipate when my anxiety and depression are going to hit but in the last week I had my first severe anxiety attack since last Christmas, followed by days of a sharp increase in my depression symptoms. For people who aren’t familiar with how this disease works, basically it makes normal, everyday activities about a thousand times more difficult than they need to be. However, I pushed through and it was worth it. The kids had their weekly swimming lessons and it was strangely quiet. Here in Melbourne, Australia, today marked the beginning of the week-long Melbourne Cup Carnival. My personal opinions about horseracing and its attendant animal welfare concerns aside, and to put it all in context, the first Tuesday of November each year marks the running of the 3,200 metre VRC Melbourne Cup, first held in 1861. Much of the most recent centuries of Australian history are inextricably intertwined with horses and the Melbourne Cup is huge. It also constitutes a public holiday in Melbourne and in at least some parts of the state of Victoria. I don’t know of any other city that has a public holiday dedicated to horseracing. Because of this, often people take the Monday off, too, gaining a four-day weekend in the process. A lot of people take it as an opportunity to go camping. Since my kids switched to public (government funded) schools they no longer get the Monday off (to their dismay). But it did mean that they were the only kids in their swimming class today which resulted in a lot more personal attention and practice than normal. After swimming we got dressed into our Hallowe’eny finest – for my daughter it meant her black cat and full moon t-shirt, for me my HP Lovecraft-inspired dress, and for my husband and son it meant, well, wearing jeans and a t-shirt. As always. We drove down to South Gippsland in coastal South-East Victoria, which has the unique distinction of being where I and my children were born, not to mention where most of my family still live. (!) 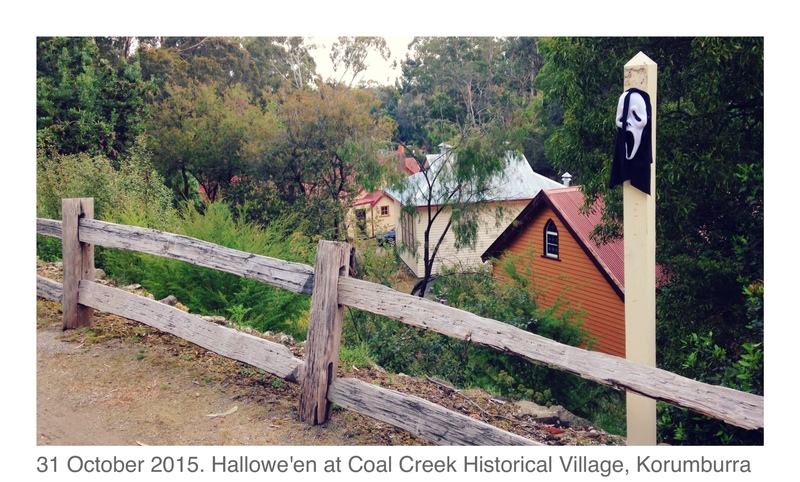 Today’s stop was the town of Korumburra, and the Coal Creek Historical Village, for their annual Hallowe’en event, where we met up with my mother and sister. 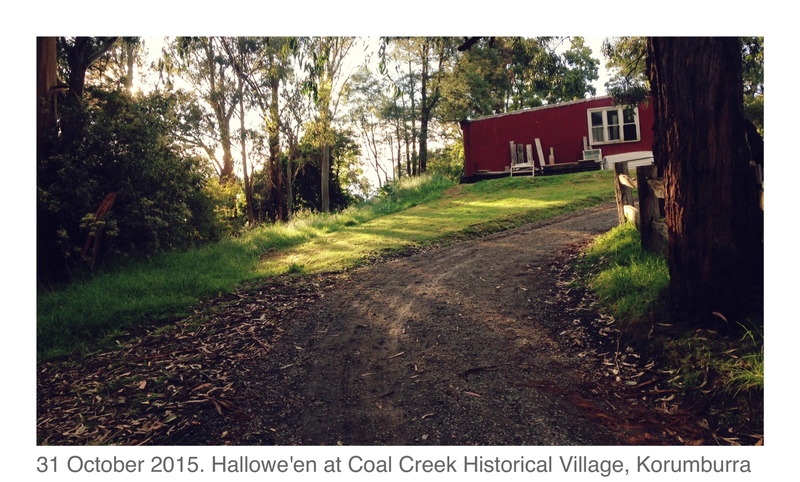 I haven’t been to Coal Creek since I was a teenager and I had many fond memories of it. It was really thoroughly enjoyable to return – it looks like they’ve done a lot of work to it and if you’re ever in South Gippsland it’s worth seeing if you can get to one of their special events. I love Hallowe’en, and I freely admit that. I know there are very reasonable laments that it’s merely some Americanised and opportunistically capitalist festival that’s been forced upon an unwilling Australian culture. But I think there’s more to it than that. For starters, a lot of Australians (myself included) have Celtic ancestry, and Hallowe’en lines up with the Northern Hemisphere’s Samhain – an ancient Celtic festival marking the thinning of the veil between the worlds. For Aussie Celtic neo-pagans it falls on roughly the same time as Beltane, the bonfire festival marking the beginning of summer (though technically we consider December 1 the beginning of summer). 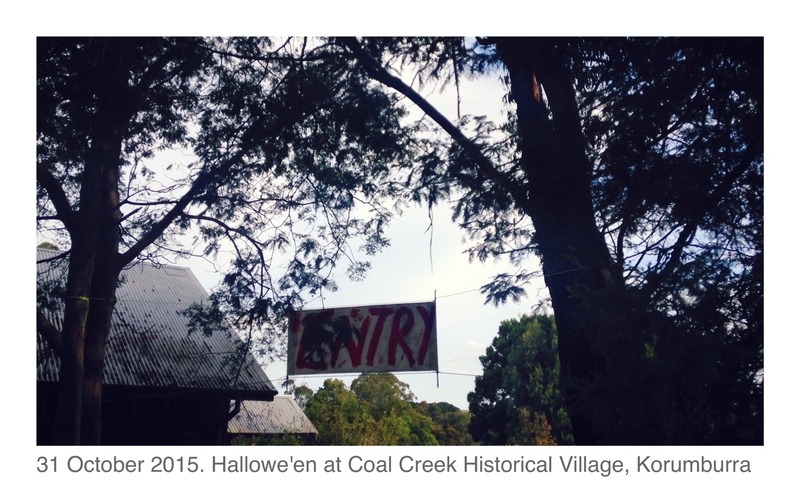 I think in some ways our Australian versions of Hallowe’en appear to be a blend of both – though it would take me a while to try to explain on what evidence I base that assertion. As a frustrated wannabe Goth, I do enjoy the visual imagery associated with the event. However, after spending their entire lives thus far in the Pentecostal community, Hallowe’en has an interesting and largely negative set of associations for my husband and children. My son was only willing to attend after I repeatedly assured him that we wouldn’t participate in any genuinely occult activity and that we were taking a stroll around to see interesting costumes and the historical park. I felt this was a positive and safe way to highlight for the kids that these events are not a matter for fear. I fully respect my children’s choice to not participate in occult, and think it’s really important they can express that. At the same time, I think that often the Pentecostal fear that there is “a demon behind every bush” as I once heard it phrased in church, easily becomes a debilitating kind of prejudice towards things and people that look different. The reality is, a bunch of families at a community event where people get to dress in fun costumes, ride an old steam train and eat good food is not a matter for fear, and I don’t want my kids avoiding the broader community out of an understandable but misguided fear fed by their paternal side of the family’s somewhat marginal* set of religious beliefs. *In Australia, the statistics show that the most common religions are Catholic at 25%, No Religion (Atheist, Agnostic, or similar) at 22%, and Anglican at 17%. Pentecostals, while representing a fast-growing segment of Australian Christianity, consist of less than 2% of the Australian population. It’s interesting marrying someone who was raised entirely within that system, and noticing that moment he realised that his religious views were not normative, as he’d been led to believe, but really quite fringe in relation to the rest of the surrounding culture. 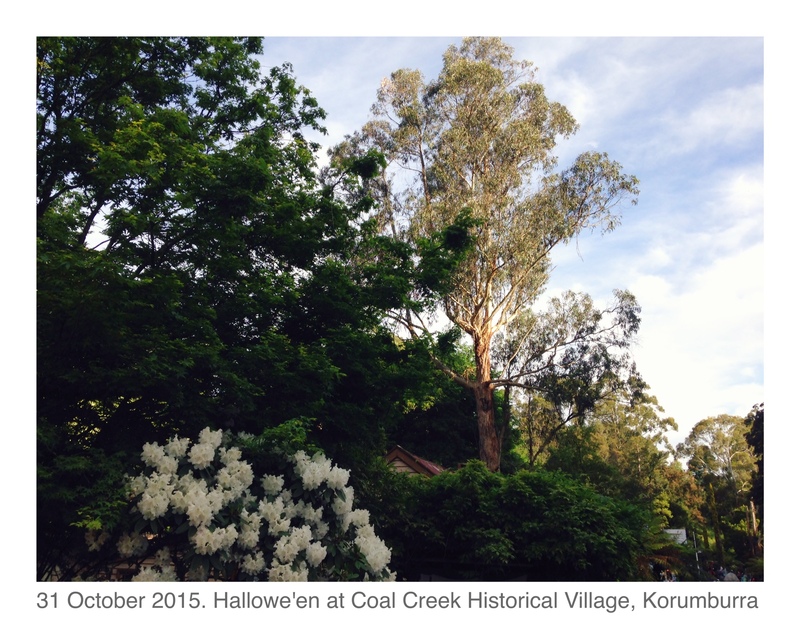 After the Hallowe’en event we headed into my hometown Leongatha for dinner with my mother and aunty. We went to an old favourite Chinese restaurant, the Orchid Inn, which I’ve been to more times than I could possibly recall. Once upon a time the restaurant was owned by one of my father’s university classmates, and we would regularly eat there on smorgasboard and karaoke night. I have a lot of happy memories of birthdays celebrations and meals in that place and it was nice to return. I enjoyed a great and filling vegan-friendly meal of tofu, Chinese vegetables and fried rice. 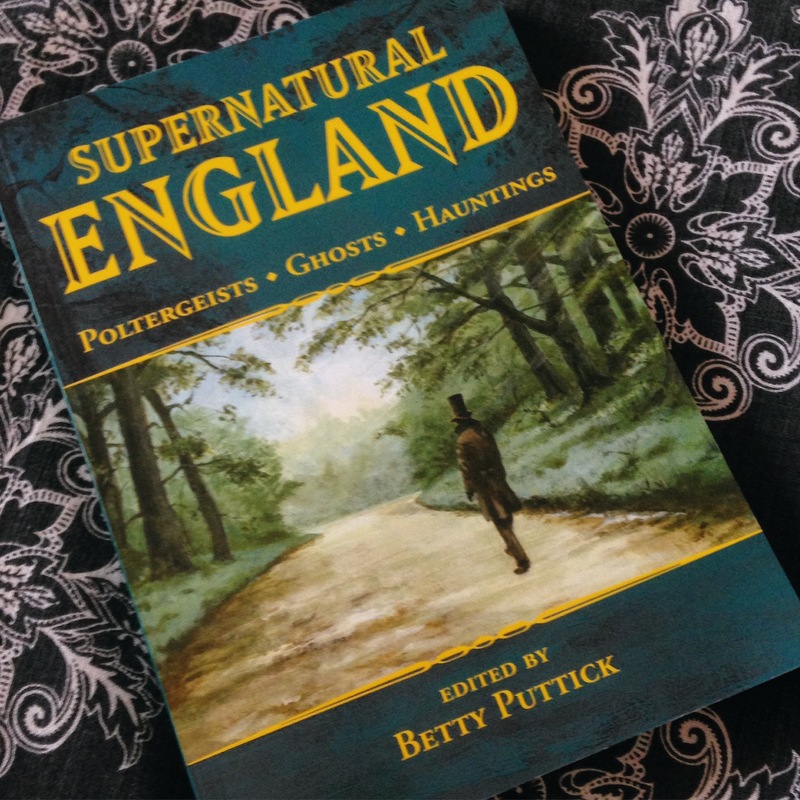 It was the first time seeing my mum since her recent trip to England and Wales, and she gave me a book she bought there, Supernatural England: Poltergeists, Ghosts, Hauntings edited by Betty Puttick (2002). It looks absolutely fascinating and reminds me of this interesting website I found recently, Legendary Dartmoor. I love “true” stories of the uncanny and unsolved mysteries and I look forward to reading it. Screenshot: Let the writing begin! 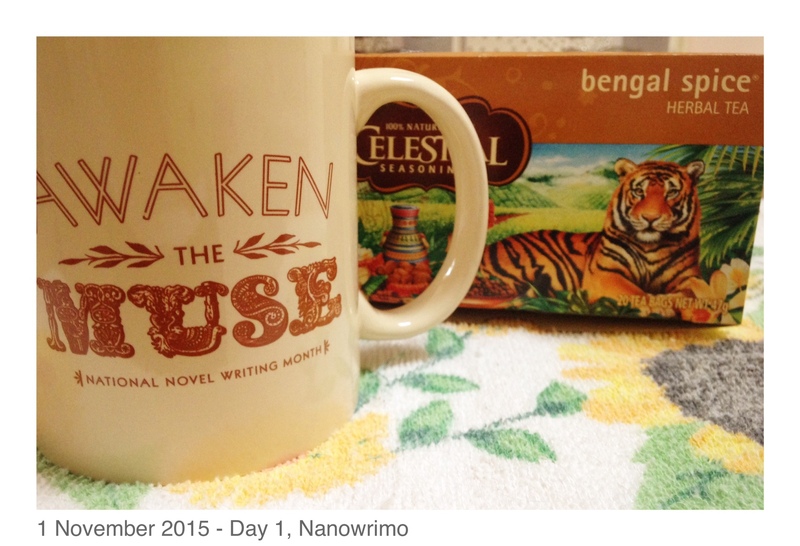 Nanowrimo 2015, Day 1. It’s day one of writing and already I’m facing my first hurdle, a mere one-and-a-half sentences into my draft: do I want to write in first person perspective, or third person? I have changed my minds on this point multiple times over the last fortnight of planning. Normally I write from the third person: I like the sense of distance it gives in making it clear that my writing is not intended to be autobiographical. It’s interesting as an aspiring writer to realise that often my first person creative writing has been mistaken for autobiography by those who know me in real life, but don’t realise I write for fun and as a way to explore the perspectives of others. I also like that third person allows for moving between different characters’ views of the events of a story. However, I find that third person is a bit too distant, because I find that I can’t delve too far into the the mind and motivations of my characters without becoming self consciously embedded within the story as the omniscience and omnipresent narrator. I also love the flow of stories like Interview with the Vampire, which feels first person – though technically I guess it’s a third person narrative depicting basically two scenes: most of the novel is one scene in which a vampire discloses his life story to a journalist. Dracula too is first person, but the perspective is shared between characters and the story is pesented as a collection of journal entries and letters. I really like that kind of immersion in a character’s psyche. I find that having a writing space conducive to creative writing is easier said-than-done. Because today is a Sunday, the children and husband are at home, and it seems to me that I can’t write without someone looking over my shoulder. I am a very guarded kind of creative: I simply cannot do a first draft of anything, whether written, painted or drawn, when I feel that I’m being watched. However, my Scrivener files are all on the big computer in the shared living space of the lounge room, and anyone walking past would be able to see what I write. So I’ve now locked myself in my bedroom with my laptop, and will write from here for today. 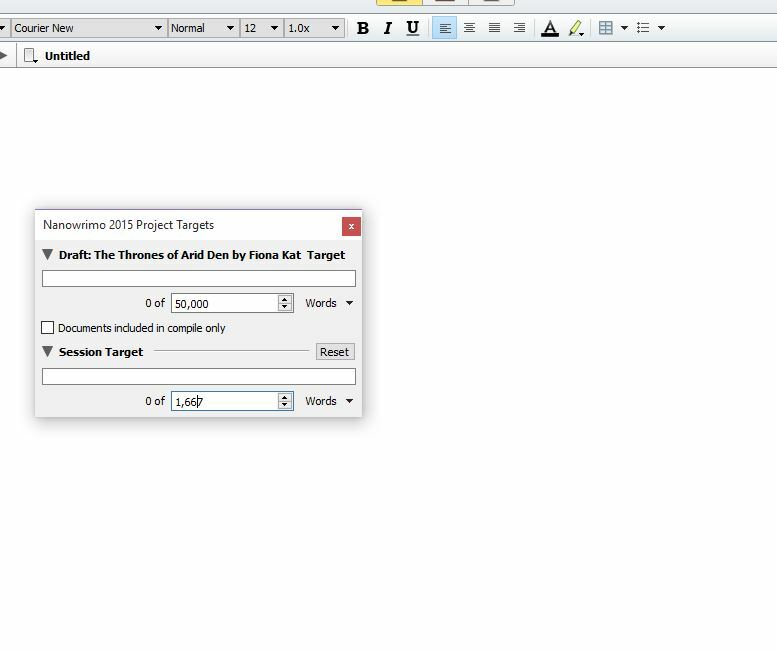 Later I’ll transfer the files across to Scrivener – and just hope that my plot isn’t going to be so complex that I need to refer to my Scrivener notes. Essential Nanowrimo supplies. Apart from writing materials, that is. Having herbal teas to try to avoid Nanowrimo-induced caffeine overload. Current word count: 28/50,000 words. Today’s writing soundtrack: Ravenhead by Orden Ogan; Schock by Eisbrecher. It’s a typically gloomy Melbourne spring day and not particularly conducive to wanting to write. It’s grey, damp and chilly. The house always has this messy, cluttered feeling after the weekend. My compulsion is not to write but to clean. But I know that cleaning, as important as it is, can also double as procrastination. I need to take advantage of the fact the kids are at school today – tomorrow is a public holiday – and churn out as big a word count as I can manage in the next six hours! The first person versus third person question became surprisingly difficult for me, so I ended up writing a page’s worth of the story in both perspectives. I loved the first person perspective for my story but it felt too limiting by reducing the story to the thoughts and experiences of a single character. Third person it is… Though if any of you have read the hilariously awful Atlanta Nights you’ll know that the collaborators didn’t quibble over stylistic problems like third versus first person narrative – that book has it all, bewilderingly changing midway through chapters. Current word count: 882/50,000 words. Posted in australia, book review, nanowrimo, photography, writing and tagged animal welfare, Atlanta Nights, australia, beltane, books, celtic, coal creek, creative writing, currently reading, depression, Eisbrecher, family, generalised anxiety disorder, halloween, history, horses, hp lovecraft, journal, korumburra, leongatha, links, melbourne, mental illness, musings, nanowrimo, nanowrimo 2015, ordan ogan, Orden Ogan, parenting, religion, religion in australia, samhain, south gippsland, spooky, statistics, TesseracT, uncanny, writing on November 3, 2015 by Fiona. “Yam of God? Biblical proof that Jesus was a walking, talking plant person” – This post gave me a good laugh. Taking Biblical literalism to its satirical extreme, it makes a very good case for why Jesus was the Son of Plant. “The not-so-ridiculous reasons people leave church” – a quick summary of the genuine reasons people leave churches, in light of the way people within churches dismiss the validity of ex-church members’ negative experiences. For me it raises the question, when will church leaders actually start listening to those of us who’ve been hurt by the church’s social structures or who raise genuine concerns? Sr Joan Chittister, the dissident nun, shares her secret life – I don’t have enough words of praise for how Sr Joan’s wonderful writings have inspired my own faith. I have barely scratched the surface of her works but I find myself often bringing to mind little snippets of her wisdom. What a powerful intellect and marvellous writer. I found this short article about her life before religious vows interesting – it adds another layer to how I understand her writings. Electromagnetic spectrum: image from Wikipedia – I found it great to learn more about it in the course I’ve been taking on Astronomy. This month I’m taking a course in Astronomy through Open Universities Australia’s free Open2Study short courses. The course is a four-week introductory overview of the science of astronomy, major breakthroughs (including, refreshingly, frequent acknowledgement of women’s contributions to science) and some mind-blowing, awe-inspiring discussions about our wonderful universe. The course is presented by a radio astronomy researcher and lecturer from Curtin University in Perth, Western Australia. As I’ve mentioned previously, though I have a lifelong love of science, for many years my particular social circumstances meant that my only exposure to scientific progress was heavily mediated by the selected reporting and interpreting of the creationist community. There were lots of reasons for this and as I’m completely disinterested in engaging in any debate (it’s just too dualistic and feels unnecessarily divisive and other people are far better at it than I), taking courses like this one has helped bring me up-to-date with current scientific understandings of the origin, expansion and development of the universe. One thing I’ve found particularly helpful in the Astronomy course is the clear explanation of what, exactly, are scientific theories (they’re not just vague hypotheses) and I have formed a far more accurate understanding of the process of the scientific method as it pertains to astronomy. The course makes me think of Franciscan priest Fr Richard Rohr’s comment (which from memory I think was in this particular lecture) that scientists are far better than most religious folks at being humble before their incomplete understanding of the universe – where fundamentalism wants the black-and-white truth and wants it right now, science is able to take its time and explore the possibilities. Posted in links, religion, science, theology and tagged astronomy, creation, currently reading, exchurch, feminism, joan chittister, links, open universities australia, open2study, purity, richard rohr, science, theology, what i'm reading online on October 29, 2015 by Fiona. I came across “Registered Runaway” a couple of years ago when I was looking for resources to help me sympathetically dialogue with the growing number of gay and lesbian Christians in my life. A recent mental health series on the blog has proven fascinating and relatable. I particularly liked this article, “Why you’re getting worse at reading,” which I connected with. I too know the agony of a dwindling concentration span directly connected to how much screen time and online interaction I have. He mentions the book The Shallows by Nicholas Carr which was a life-changing book for me. It came along when I was struggling with the demands of university and got me to step away from the computer and pick up books again. I was raised liberal-progressive Roman Catholic, in a family with a mix of Atheists, Agnostics, Neo-Pagans and, obviously, at least a few other Catholics at varying degrees of commitment. In that context, I never in my life had reason to question the conventional wisdom of evolutionary biology, astronomy and geology. Then I got married. Interestingly, even though my husband’s immediate family and friends tended to be variants on what I later found out are called Young Earth Creationists (YECs), one day I realised that the church he’s from and that we attended for most of our married life thus far actually holds the view that it’s up to the individual to decide what they believe. They actively present a multiple array of views and say quite explicitly that it’s not up to the church pastors to decide which view is correct (which may come as a shock to outsiders but no, it’s not always about brainwashing the masses). It’s a lot more laid-back as far as Pentecostal communities go. At the time I was led to believe that if I wanted to be a real Christian I had to take Genesis literally or I was a compromiser. Here I am 14 years later and my husband has increasingly embraced the rational and the scientific to the extent that his views have changed a lot. We met when we were 19 years old, and you’d kind of hope we’d progressed in our faith journey between the ages of 19 and 30-something. In the meantime we’ve also both finished two university degrees each. I’m qualified as a sociologist with a focus on the environment and human societies. He’s got a Master of Engineering degree and is quite the scientist. We have learned a lot over the years and that includes learning a whole lot more about how science works, what scientists believe, what Christians think scientists believe and so on. After much careful consideration and reflection we reached a point of no longer accepting the YEC viewpoint. It’s not a decision made lightly, knowing full well the kinds of vitriolic criticism, shunning and accusations of backsliding we would possibly face from some church members. Let me be clear: I have nothing against my creationist friends whatsoever, and if any of them are reading this I hope that my change in opinion will not dismay you and that one day, even if you never change your mind, you’ll understand that I am simply following the information as I best understand it. And aren’t we all? For a decade my only exposure to science was through the heavily mediated and pre-approved Creationist texts that compiled snippets of journal materials and framed them with Christian apologetics. You have to understand – I was raised in a family of science geeks. We love science. To stop reading it was to throw out who I am. And then, one day about a year ago, I decided I wanted to learn more about feathered dinosaurs. However, for a number of years I only read about dinosaurs in Creationist texts and so I know just about every apologetic imaginable about how to interpret dinosaurs and fit them on Noah’s Ark (take babies, or eggs, and only two of each kind, which might represent family or order level biology and not species-level). I know all of the claimed dinosaurs in the Bible passages (how dare the study notes claim that Leviathan is a mere crocodile when clearly it’s a Kronosaurus!). I know the “real” reasons dinosaurs died out (a post-Flood Ice Age killed off their sluggish cold-blooded selves… even though evidence suggests that dinosaurs were warm-blooded, and that some of these were furry or feathered). And feathered dinosaurs are either a hoax or their own created kind. But for many myriad reasons, I found myself increasingly dissatisfied with Creationist apologetics. Now, I’m not going to go on about it. I really have no reason to stop Creationists believing what they believe because I have identified as that myself for about a decade and I shared their materials out when I was leading Bible study groups and have read all the best writers in the field and still find useful some of their questions about the origin of life and death, the way the evidence is interpreted and the way it applies to our identity as humans. I have found some interesting sites for those who want to explore critical assessments of YEC viewpoints. I’ll list them here but I can’t emphasise enough the fact that I’m not interested in a debate. I am so thoroughly burnt out on Christian apologetics. It feels to me these days like a noise, a clanging gong, rather than a path to knowing Christ. While I have not experienced any of the extreme forms of religious abuse and violence sadly faced by many people, I found myself reading up on these issues partly because I studied Sociology of Cults as part of my uni degree and found it compelling; and secondly because I have experienced or encountered the low-level forms of cultic control that go on; including psychological manipulation, control, disempowerment, financial abuse, forced “volunteering,” a loss of control over one’s schedule, shunning, fundamentalist ideology fuelled by fear, complementarian perspectives on women, punitive and harsh disciplinarian systems of child rearing (for examples of these see here and here), dysfunctional and unhealthy social dynamics, gossip as a means of keeping people under control, a fear of science and psychology, etc. I read about it to try to understand it sociologically, and to share what I learn with those who might need to hear that what they’re experiencing in God’s name is a very human phenomenon and not in any way representative of that which is good and pure and lovely and perfect in the Universe. Here are some materials that I’ve read recently on the topic. Proceed with caution if you are likely to be triggered by articles referring to abuse, control and religion. An article on links between complementarianism and the systematic abuse of Christian women. Homeschoolers Anonymous – this site has a lot of material written by homeschooled survivors of cultic church communities. A confronting testimony by an in-real-life friend who is a cult survivor who has incredibly come out the other side able to communicate her experience to help others. A survivors’ online community relating to their experiences as patients of a mental health charity that was once enthusiastically supported by the Aussie Pentecostal community. Book: The Failure of Evangelical Mental Health Care by John Weaver. Here are the books currently taking up space in my reading pile. The top three are from the library and I’m yet to make any real progress in them. On the bottom, I’m borrowing a friend’s copy of Surprised By Hope. I bought Human Universe by Professor Brian Cox and Andrew Cohen just recently and so far it’s incredible. Tales from the Dead of Night: Thirteen Classic Ghost Stories, selected by Cecily Gayford, was my birthday present to myself last year and it is fantastic. It includes ghost stories by such authors as E. Nesbit, Ruth Rendell and Rudyard Kipling. This is my third time reading through the collection, many of which come from the late 19th and early 20th Centuries. There is just something about the way late 19th Century writers composed their tales that really draws me in. Without having intended it, I have found that roughly half of my most-favourite books come from Europe in the 19th Century, usually Russia and England, but some from other countries, too. Hence the fact I picked up the 1830s and 1840s short story collection by Nikolai Vasilievich Gogol (or, if you prefer the Ukrainian translation of his name, Mykola Vasyliovych Hohol). Now, I won’t enter into the debate of his ethnicity or nationality, as those discussions are beyond me. Because my husband is part-Ukrainian I find it interesting learning about Eastern Slavic history, and have found that these old Russian novels are a really interesting insight into the culture. I particularly love the writings of Fyodor Mikhailovich Dostoyevsky – Crime and Punishment and The Brothers Karamazov are novels that were life-changing for me. So far I haven’t read much of Gogol’s works. I have read some of Dead Souls though I’m fairly certain I never finished that. I have also watched two different film adaptations of his story Viy (Вий), a somewhat terrifying horror story. The 1967 film is said to be quite faithful to the original story, which I haven’t yet read. I also saw the 2014 version at a Russian film festival held at ACMI in Melbourne, Australia. I must’ve been one of five non-Slavic people in the whole audience (the others being a handful of our Anglo-Celt and Anglo-Asian friends – I love our multicultural city!). The 2014 film had rather steam punk vibes about it, and plot-wise had some similarities with the 1967 film, but only loosely so, and was a mix of Russian, Ukrainian and English elements. It also, in my mind, inspired moustache goals that I have since insisted the Husband fulfil. He’s not convinced. The other two books on the pile, The Discovery of Middle Earth: Mapping the lost world of the Celts by Graham Robb is, as far as I can see, a history of Ancient Gaul and Druidry and the spread of Christianity through ancient Europe. Where Song Began: Australia’s birds and how they changed the world by Tim Low is an evolutionary history of the unique and diverse birdlife of our continent. I look forward to delving into these books. Cox, B. and Cohen, A. (2015). Human Universe. London: WilliamCollins. Gayford, C. (2013). Tales from the dead of night: thirteen classic ghost stories. London: Profile Books. Gogol, N. (translation from 2014). Petersburg tales. Richmond, UK: Alma Classics. 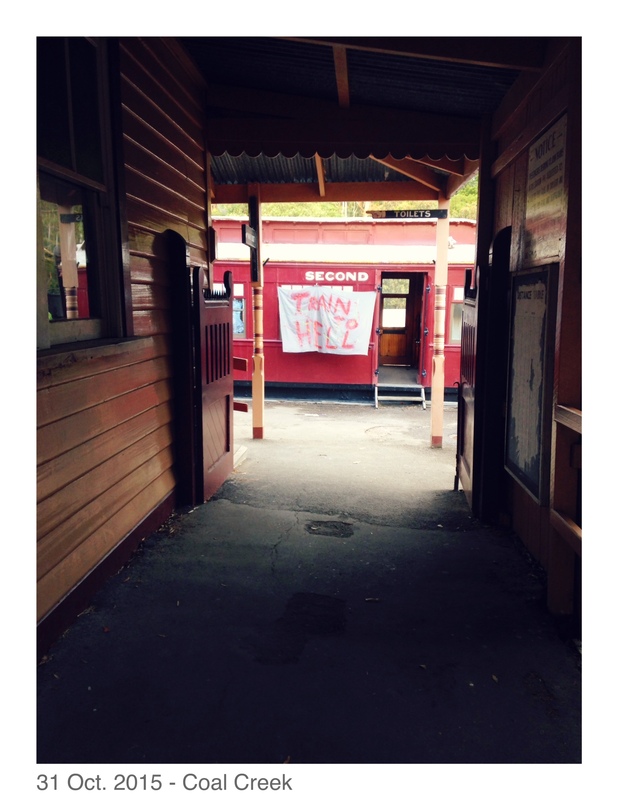 Low, T. (2014). Where song began: Australia’s birds and how they changed the world. Melbourne, Australia: Penguin. Robb, G. (2013). The discovery of Middle Earth: mapping the lost world of the Celts. New York: WW Norton & Company. Wright, T. (2007). Surprised by hope. London: SPCK. Posted in animals, book review, history, links, science and tagged australia, australian fauna, birds, books, brian cox, celt, celtic, celtic history, crime and punishment, currently reading, dostoyevsky, e nesbit, eschatology, european history, evolution, fyodor dostoyevsky, gaul, ghost stories, gogol, history, links, nikolai gogol, nt wright, ornithology, philosophy, professor brian cox, rudyard kipling, russian, science, short stories, the brothers karamazov, theology, tom wright, ukrainian on September 16, 2015 by Fiona.